Enough of the smack talking. Its time to walk the talk with our very own Biatch Match where drifters have a chance to go head to head with anyone they choose on a judged tandem battle. Both drifters are required to go for a qualifying run to determine the order of who leads the first run and the tandem battle is judged like a conventional drift competition where proximity, line and angle is taken into account in determining the winner. We are open for more participants.!! Watch this space of announcement of time and location!!! 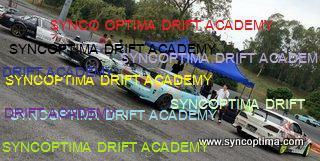 This entry was posted in Drifting, Sync Optima Events on July 27, 2011 by skagee. You are all invited !!! Same time same place!! This entry was posted in Drifting, Life Style, Posting by Ariff on July 5, 2011 by skagee. A fun filled event participated by the who’s who of autocross/gymkhana in Malaysia like Mickey Teoh, Alvin, Johnson , Mitch and Adam was held in the Cyberjaya Sport arena parking space. Unlike the traditional gymkhana event, drivers are required to go through qualifying where the top 8 fastest time of the two catagories FF and FR/AWD are to go against each other in a heads up match. Both tackling mirror courses , side by side and switching over to decide the winner. Jane , who qualified 5th fastest of the day had to go against veteren autocrosser , Johnson Tan which led to four re runs(!!) before Jane finally admitting defeat due to an error on her figure 8 in the course! Truly impressive considering the car she was driving was still in drift set up and she will definately be back for more!! This entry was posted in AutoCross, Autokhana, Posting by Ariff, Red Bull on July 5, 2011 by skagee. Anyways so much for that but on the good note I was very pleased at how I have finally got SLOW’s handling sorted out( finally) and Jane though didnt qualify , was able to show case her ever improving skills and maturity and was able to mix with the big boys!! This entry was posted in Formula Drift, Goodyear, Posting by Ariff, Red Bull on July 5, 2011 by skagee.